Have you ever wanted a phone that embodied your devout loyalty to your favorite beverage? If your preferred drink is a Pepsi, then you're in luck. If not, the unanticipated nature of today's news might still hold some intrigue. 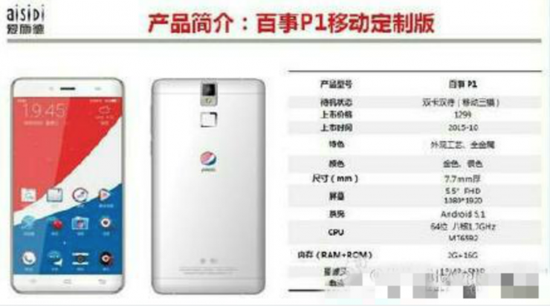 After ambiguous announcements on Chinese site Weibo, Pepsi's intentions do seem to be to make a smartphone, according to leaks. The device is expected to be a mid-range handset and may launch October 20 in China. Pepsi seems to have been dabbling in the smartphone industry. It isn't known which manufacturer collaborated with the beverage company, but they've come up with the Pepsi P1. The device is rumored to have a 5.5-inch 1080p screen, meaning this is more of a phablet than your everyday phone. The P1 is run by a 1.7 GHz MediaTek processor, aided by 2 GB of RAM. The main camera has 13 megapixels while the front-facing shooter has 5. Pepsi's device is predicted to pack a meager 16 GB of internal storage, but no word about possible microSD card integration has been mentioned. On the other hand, the battery is a sizable 3000 mAh. The P1 is an inexpensive Android, running the latest version of Lollipop and valued at $205 in China. There isn't any definitive word on whether the device will see a release outside the Asian region, especially considering only Pepsi's Chinese branch appears to have any connection to the phone. It's likely that the P1 will be manufactured in Asia by independent companies due to Pepsi's lack of suitable plants. It may be possible the soft drink maker struck a deal to have a manufacturer release a handset with the Pepsi logo and endorsement, but if that's the case the P1 seems more of a promotional play than anything else. Pepsi's first smartphone doesn't look like it aspires to much, but at its price point and specs it could lure a few buyers. I can imagine it will draw some bewildered looks from more than a few, and it's questionable how the Pepsi logo will influence shoppers. The smartphone industry ballooned rapidly and adding yet another player might not seem the best business move, although I will admit the phone has yet to be tested. If Pepsi is satisfied with the results, the world may very well see a line of Pepsi phones, complete with the flavor of your choice.